Reading recent work on Italian Thought and biopolitics, one might be forgiven for thinking that biopolitics and biopower are deeply negative concepts. What gives? Why the relentlessly negative characterization of politics inflected biologically? One reason may well be that in the field of contemporary Italian Thought power often veers toward the tragic. In this talk, Professor Campbell takes up Michel Foucault’s reading of the entrepreneur in his lectures on biopolitics in light of recent work in Italian Thought in order to draw out tragedy’s deep enmeshment with ownership and the self as possession. The talk will also consider Foucault’s reading of the Cynic as a carnivalesque form of life, which may be redefined as the comic self. Drawing upon the work of Carla Lonzi among others, it is thus possible to conclude that the limits of Italian Thought are to be found in its inability to come to terms with a practice of the comic self that embraces dispossession. 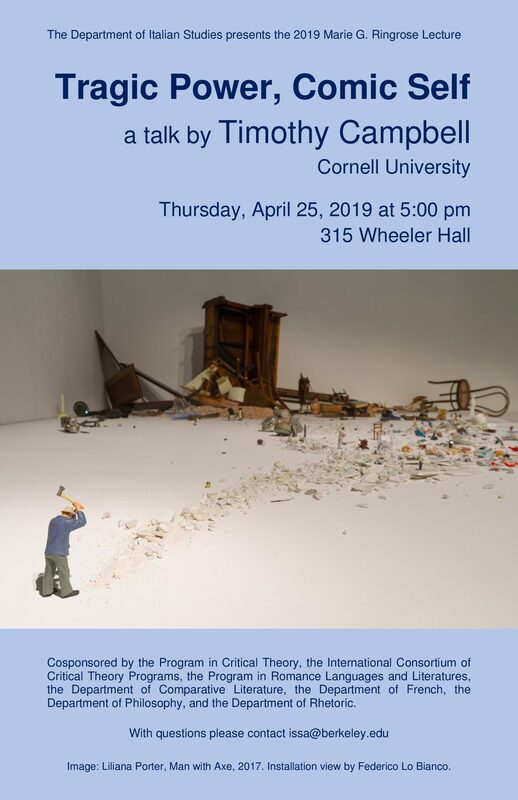 Cosponsored by the Program in Critical Theory, the International Consortium of Critical Theory Programs, the Program in Romance Languages and Literatures, the Department of Comparative Literature, the Department of French, the Department of Philosophy, and the Department of Rhetoric.